Ferestiens is the one-stop-shop for all your environmental supplies including construction hay, silt fencing & wattles. We are here to help you choose the right product for your job, with plenty of staff on hand to assist you in your selection. We also deliver to the Rhode Island and Massachusetts area so contact us with any questions or for a free quote! Straw Wattles are made from recycled, naturally weed-free straw. The wattles imitate natural stabilization by reducing rate of flow, absorbing water and filtering sediment runoff. By trapping silt and seed, the wattles allow native vegetation and brush to begin to revegetate and restore root integrity within one year. Stabilization of the hillside will eventually transition to the reformed growth as the Wattles decay. The wattles also form a durable containment area to prevent polluted runoff from reaching surface waters. Straw Wattles replace Silt Fences, Sandbags, Willow Wattles, and Straw Bales with a natural, earth-friendly, weed-free solution. A silt fence is a temporary sediment barrier. It is made from woven, synthetic materials that allow water to seep through, but do not allow larger silt particles to pass. The materials are selected to withstand the elements, and their specific properties are typically referenced in a jurisdiction’s specifications. Silt fence is staked in place between the disturbed ground and the waterway or drainage system that it would flow to. 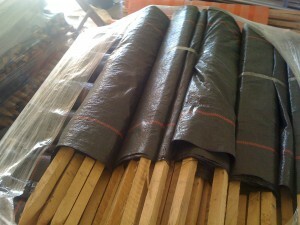 Silt fence is designed largely to catch sheet flow over a fairly broad area. It is not meant to be used in high-flow situations, like across a ditch or stream. We also carry 2′, 3′, and 4′ hardwood wooden stakes. Use these secure down straw wattles and mulch tubes. 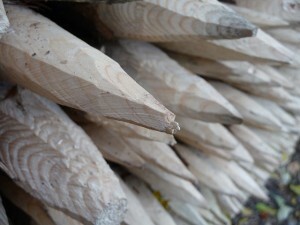 Stakes are pointed at one end to allow it to be easily driven into the ground. 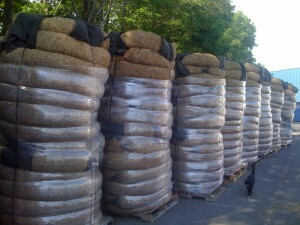 Sold in bundles of 25..
Mulch hay, sometimes called "construction hay" bales are also used with silt fence to control erosion. 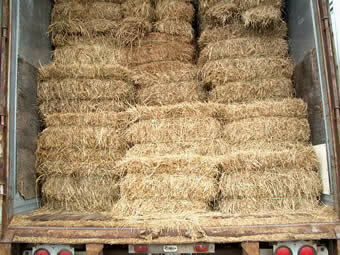 While this hay may also be used to mulch gardens, we suggest straw as it contains little or no seeds. 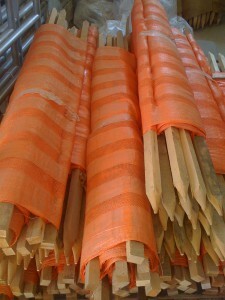 Ferestien Feed sells hardwood wooden bale stakes 3-feet long (bundle of 25) to anchor the bales. Typically 2 stakes per bale are used.